As environmental regulations tighten, public awareness becomes more acute, and technology evolves, site assessment and reclamation are becoming more and more important to companies in a variety of industries. 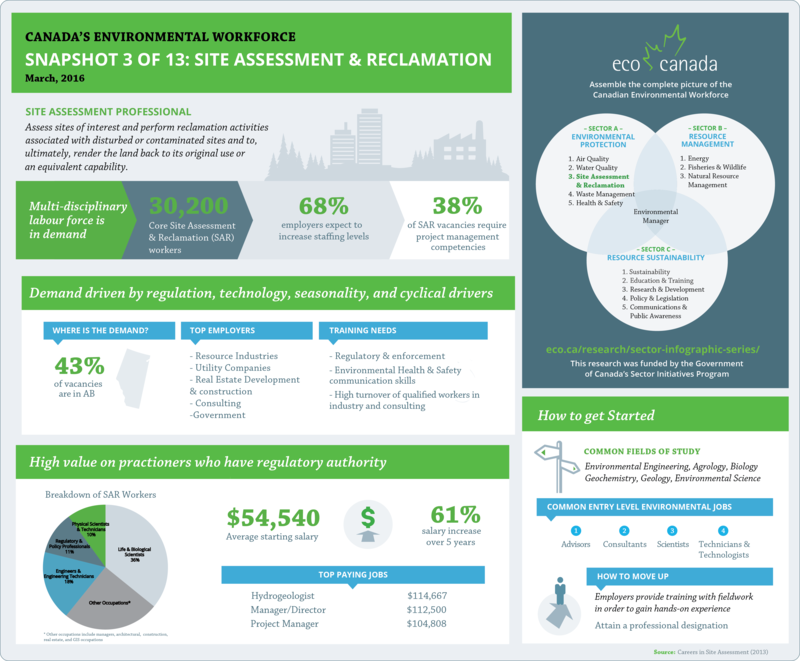 More than 30,000 environmental professionals across Canada make up the Site Assessment and Reclamation (SAR) labour force; their ranks include chemists, engineers, planning and design experts, and communications professionals. The Site Assessment and Reclamation Snapshot includes an overview of the prospects for future employment, areas of growth, key skills, salary expectations and more. The takeaway: SAR professionals can expect positive growth in the near future, with a majority of employers planning to increase staffing levels. But we won’t give it all away in this post — take a look at the snapshot below and explore other labour market trends uncovered by our research team. Make sure to check back next month as we look at another area of the sector! Subscribe To Receive Training Discounts, Insights & News.